Buy Magnifiers, Reading & Writing Aids in Ireland. Browse through our range of magnifiers, reading and writing aids below, we provide nationwide courier delivery to your door anywhere in Ireland. Securely order online today! 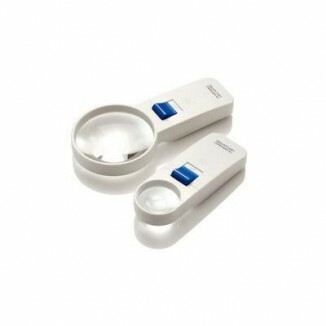 These hand-held LED magnifiers have a scratch-resistant aspheric lenses offering 4x or 7x magnification. The LED light helps to highlight everyday text, maps and photos and provides bright, even illumination for close inspection tasks and hobbies. Ideal for use in areas of poor illumination or limited natural light. Comfortable to hold with a sensibly-positioned easy on/off switch on handle. Requires 3 AAA batteries (not included). This product may be referenced by 09-132-9549 or 091329549 ..